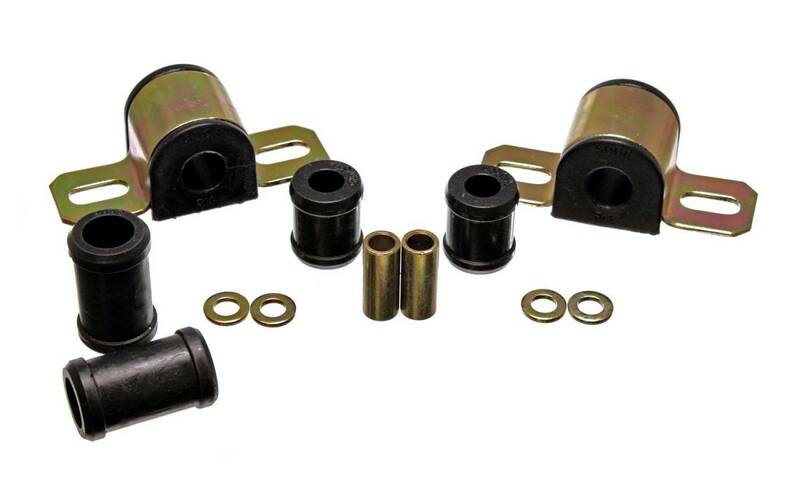 Polygraphite Rear Sway Bar Frame Bushings 15/16"
One of the primary problem areas in classic muscle car suspensions is the use of rubber bushings. They were cheap to manufacture for mass production and provided isolation from road noise and vibration, but rubber has a significant trade-off - it's relatively soft durometer (hardness) allows for significant deflection of the chassis components under load. The rubber bushings twist and deform as the suspension components rotate, causing premature wear and unpredictable handling. Rubber eventually dry rots when exposed to the elements and degrades in the presence of grease and oil. PST perfected polyurethane with the introduction of POLYGRAPHITE - special formula incorporating a low-friction graphite lubricant into the actual bushing material. With POLYGRAPHITE, you get the near-zero deflection performance of polyurethane with a self-lubricating bushing. As an added benefit, POLYGRAPHITE is impervious to grease, oil, weather, and other natural elements and will never dry rot. PST has the most complete line of POLYGRAPHITE bushings available for your muscle car. Replace components as needed, or save time, money, and reap the ultimate performance benefits by installing one of our complete POLYGRAPHITE Kits on your vehicle today!